With summer well on its way, you want to be sure that your air conditioner is equipped to handle any heatwave that comes our way. But sometimes, your system is going to require repairs, and when that happens, you’re going to need to call your local HVAC technician right away. Trust us, holding off on repairs is only going to make matters worse, leaving you with an even costlier repair bill. But, how do you know when it is time for AC repair in Alexandria, VA? Well, there are plenty of signs that indicate you need to schedule repairs ASAP. So for your convenience, we’ve listed a few of these signs below. Keep reading to find out more information. One of the first tell-tale signs of a faulty air conditioner is strange noises. Your AC is not inherently noisy. In fact, the only sounds you should hear coming from the system is the sound it makes when it clicks on and the sound of air gently whooshing through the vents. So, noises that resemble screeching, clanking, banging, humming, or rattling are definitely a cause for concern. Your repair technician will be able to pinpoint the exact source of the sound in order to fix your system properly. 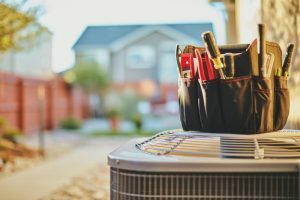 The primary role of your air conditioner is to keep your home cool and comfortable during the summer, so if you notice that it is unable to provide your home with cool air, then it is definitely not performing as it should. A lack of cool air definitely should warrant a call to your local HVAC contractor. There are a number of issues that could contribute to a lack of cooling power, including dirty coils, a clogged air filter, or even an air leak. Be sure to have it checked out! Short cycling is a term used to describe when your system repeatedly turns on and off throughout the day without ever completing a full cooling cycle. Not only does this put a lot of strain on your air conditioner, but it is also extremely inefficient. It takes a lot of energy for your AC to begin the cooling cycle, so imagine just how much energy is wasted when it is constantly doing so. Short cycling is a serious problem, so it is important that you schedule service right away. We recommend keeping a close eye on your energy bills this summer. If you are finding that you’re paying more than you’re used to, then it could be that there is something wrong with your air conditioner. High bills suggest that your AC is inefficient, often due to an underlying issue. A professional technician should be able to locate the root of the issue and repair it promptly, ensuring that your bills stay where they should. To schedule your air conditioning repairs this summer, contact Polar Bear Air Conditioning & Heating.